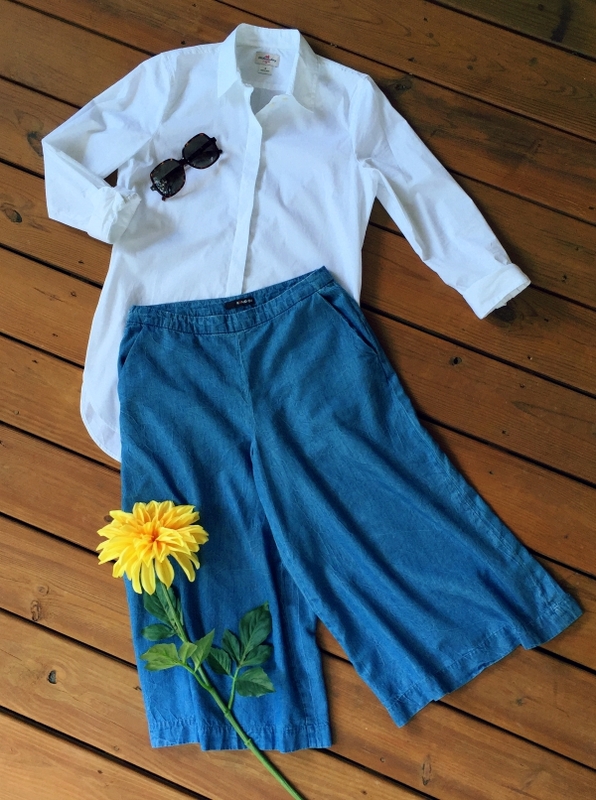 New in ~ white button down & chambray culottes! I prefer chic yet versatile pieces to get the most wear out of my wardrobe, and these two are my latest choices. This ‘crisp white + breezy denim’ pairing is perfectly summery yet classic enough for the office. Every professional woman needs a white shirt as it never goes out of style. The hidden buttons up the polished vibe. Culottes are one of the hottest trends on the fashion scene right now. They are ultimate in flattering. Think of them as a skirt but with the comfort of pants. Regardless of the latest trend, you simply can’t go wrong with a button down and denim pants. I’m a savvy shopper like many of you so this time was no exception. I bought these 2 items through Splender. It’s a place where you can shop, save and get cash back. My 1st experience of the site was positive – straight forward & simple to navigate. They list over 800 stores along with current deals & promos offered at each store. The overall feel of the site is not fashionably impressive but I was mainly here to find the deals. I checked out some of my favorite shops. I ended up buying the culottes from Macy’s & the shirt from J.Crew Factory. Not only did I save by clicking the link offered on Splender but I also received $1.82 cash back into my account. It’s not much but the more you shop, the more $$$ you can earn. How does it work? Simple. You chose the store -> click a deal or sale you want -> you will be directed to that store -> purchase as usual -> the store pays a commission to Splender -> your shared portions go into your Splender account. Your total balance must be $10 in order to be transferred as payment. Granted, we all have our favorite go-to shops. But Splender is great if you want to check out the latest coupons or sales from numerous shops with the hassle of hopping from one shop to the next. I think it’s a win-win situation for both the retailer and the customer really. Would you give Splender a try?